There was a time in Jesus’ life when He went up a mountain to pray. What makes this experience different was that He chose to take Peter, James, and John along with Him. I am sure Jesus needed this “alone time” to pray. The disciples needed it. I am sure you and I need these times as well. Sometimes we are called away to pray and other times we choose to get away to pray. In either case, we can expect God to meet us in these places. You and I are never going to face a problem which God has not handled numerous times. Nothing we face is either too small or too big for God to answer. 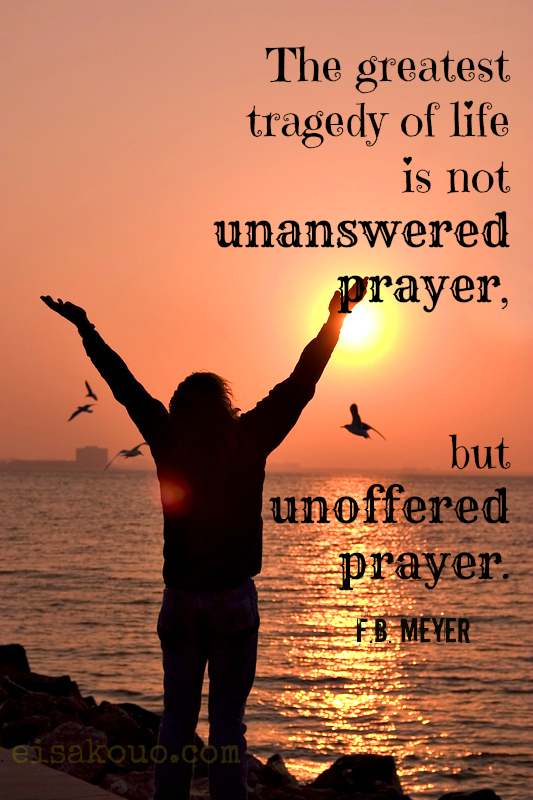 Prayer is always about our relationship to God, not our requests. Yes, it is our needs which drive us to pray more fervently .. but God answers because of our relationship. This is why Jesus was transfigured on the mountain. Do you still view prayer as a vehicle to change God and your circumstances? Or, do you view prayer as God’s opportunity to change you? There is a difference and I will address this next time. Hmmm…. I have sung that hymn a bunch and I have carried too many weights and pains needlessly. Thanks for “liking and reblogging.” Blessings! Thanks for the encouragement… May God continue to richly bless you.